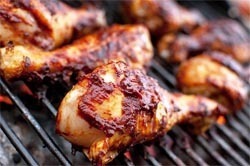 Findlay Foods Info Article: It's all about the BBQ! Everything you wanted to know about BBQing and Grilling! What's the difference between Grilling and BBQ? Many don't understand the differences, and even when they do they tend to use these two terms interchangeably. But to the best chefs the differences are night and day. Direct grilling refers to the method whereby you cook directly over hot coals (see section below to determine how hot, hot, really is) usually with the cover off to maintain optimum temperature of the coals. This is true grilling because the essence of grilling involves the quick searing of the surface of the food. This ensures the charring and caramelizing that defines grilled food. Indirect grilling is not true grilling, it's really more like oven roasting, but done outdoors on a grill. For this method the coals are heaped on two sides of the grill with an open space between them and often separated by a drip pan. The food is placed in the center of the grill and cooks indirectly with the grill covered to build up enough heat to roast the food. A general rule-of-thumb is that anything taking a short period of time should be grilled directly and anything taking longer should be grilled indirectly. As with all rules there are exceptions. Take for example beef steaks. Steaks should be seared directly over the coals and then finished indirectly, off of the coals. The charts below suggest which method to use based on the type of meat as well as the particular cut. Multi-Level grilling means maintaining different levels of heat in the same grill. This is accomplished by stacking the coals so as to produce two (or more) heat zones. This is ideal for foods that need to be seared over very hot coals then moved to a cooler fire to finish off the cooking. Here is a tried and true technique for determining if your grill is ready to cook. This terminology is widely accepted by grill chefs so now when the recipe calls for a "hot" grill you'll know just when yours is ready. The temperatures in the charts below are generally lower than those published by the USDA. This is due to their natural concern about food safety. However, most professional cooks feel the higher temperatures are unwarranted, and overly conservative. The temperatures found here are in keeping with those used in fine restaurants. For in-between doneness, for example medium-rare, split the difference shown here. As mentioned earlier, the cooking times are approximate due to the differences in fire temperature from grill to grill. It is advisable to starting to check the meat with an instant read thermometer when you reach the low end of the cooking range. Lastly, keep in mind that thewill rise after allowing the meat to rest for a 5-10 minutes after removing it from the grill (this is recommended). The temperatures given here tell you when to remove it from the grill not the final temperature before serving. Steaks: Grill steaks for the time given in the chart or till desired doneness, turning once halfway through grilling time. Cooking Method: Multi-Level - sear over high heat then finish over medium heat. For searing, allow 2 minutes for 1-inch-thick steaks and 4 minutes for 1 1/2 - 2-inch-thick steaks. Turn steaks and move to a cooler medium heat to finish grilling, turning once halfway through remaining grilling time. The cooking times in the chart include searing. Ribeye 1/2 in. 5-7 min. 7-9 min. 9-11 min. 1 in.1 1/2 in. 6 -7 min. 12-15 min. 15-19 min. 2 in. 10-12 min. 17-19 min. 19-22 min. Roasts: Place meat, fat side up, in center of cooking grate. Grill indirect for time given in chart. Use a meat thermometer to check meat for desired internal temperature. Whole Tenederloin 4-5lbs. 50 min-1 1/2hrs. 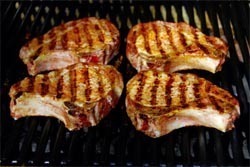 Chops And Steaks: Place chops on cooking grill. Grill for the time given in the chart or till desired doneness, turning once halfway through grilling time. Cooking Method: Grill directly over medium heat. The thickest cuts may need to be moved off heat (i.e. indirect) to finish. Loin, rib, and shoulder 11/4-11/2 in. 35-40 min. 40-45 min. Roasts: Place the meat, fat side up, in center of the cooking grate. Grill indirect for time given in chart. Use a meat thermometer to check meat for desired internal temperature. For best results cook to medium, not well done. Smoked picnic 5-8 lbs. 1-2 hrs. Whole ham, bone-in 10-12 lbs. 2-23/4 hrs. Loin center rib roast, backbone loosened 3-5 lbs 1-2 hrs. 2-2 1/2 hrs. Rib crown roast 4-6 lbs 3/4-2 hrs. 2-3 hrs. Loin back ribs or spareribs 3-4 lbs. 1-1 1/4 hrs. *Tenderloins (see note below) 3/4-1 lb. *Tenderloins: Tenderloins are the exception to these guidelines. They should be cooked like steaks, seared over high heat and finished over medium heat to an internal temperature of 145 degrees. 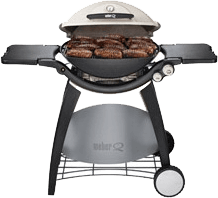 Boneless breast, turkey patties and turkey tenderloin steaks: Grill over medium heat for the time given in chart, turning once halfway through grilling time. Turkey patties (ground raw turkey) 3/4 in. thick 10-12 min. Poultry pieces (with or without skin): Grill over medium heat for the time given in the chart. During the last 10 minutes of grilling time, brush with sauce, if desired. Whole birds: Place whole chicken or turkey, breast side up, in center of the cooking grate. Grill for the time given in the chart or until registers 180 degrees. When checking for doneness with a meat thermometer, insert in the center of the inside thigh muscle, making sure the probe does not touch the bone. Cooking Method: Direct for pieces. Indirect for whole birds. Broiler-fryer chicken, halves 1 1/2-2 lbs. 1-11/4 hrs. Broiler-fryer chicken, whole 3-4 lbs. 1 1/4 -13/4 hrs. and drumsticks From 3-4 pound bird. 35-45 min. Cornish game hens, halves 1/2 -3/4 lb. ea. 40-50 min. Cornish game hens, whole 1-11/2 lbs. ea. 45-60 min. Turkey, boneless, whole 2 1/2-3 1/2lbs. 1 3/4-2 1/4 hrs. Turkey, *unstuffed, whole 6-8 lbs. 11/4-2 hrs. Turkey breasts, half 3-4 lbs. 11/2-2 hrs. Turkey breasts, whole 4-6 lbs. 11/2-21/4 hrs. Turkey drumsticks 1/2 - 1 1/2 lbs. ea. 3/4- 1 1/4 hrs. Turkey hindquarters 2-4 lbs. ea. 1-11/2 hrs. Turkey thigh 1-1 1/2 lbs. 50-60 min. Cooking time is gauged by the heat of the fire, the width of the fish at its thickest part, and the distance of the grill from the heat source. For most shellfish and steaks, use a medium-hot grill. 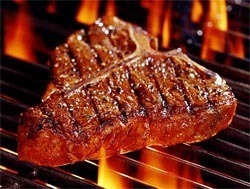 The rule-of-thumb for steaks is 10 minutes per inch at four inches from the heat source. Whole fish should be cooked at a lower heat. All times in the guideline chart below reflect total cooking time. To test for doneness, cut into the center of the fish at its thickest part. If it is opaque throughout but still moist, it`s done. Another test is to press the flesh; if soft, it`s not done; if hard and firm, it`s overdone; if firm but springs back, it`s done. Shellfish should also be just opaque and will be dry if overcooked. These grilling times are approximate, so you need to keep a close eye on the fish to keep it from overcooking. 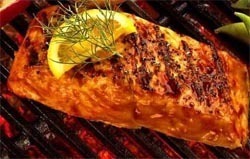 Because it doesn't hold heat, fish needs to be served immediately, hot off the grill. 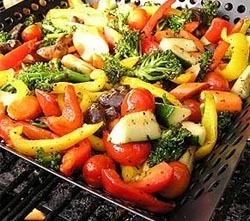 The trick with vegetables is getting them to cook through at the same time - not always an easy task since we frequently like to eat a variety of different veggies together but their grilling times vary widely. Following these guidelines should help. After a time or two you'll be able to judge how to apply them to your particular grill and preferred degree of doneness. Make sure you marinade the veggies plenty of recipes here at Recipezaar/ Food.com or brush them first with oil to prevent sticking. You may thread them on skewers, lemongrass or rosemary twigs, use a grilling basket or place them directly on the grill. Cook them in a closed grill and turn once, halfway through the cooking time. These are Estimating Grilling Times ! We all like our foods the way we like them! So please use these as a guideline only. *Remember safety first, we recommend you always check internal temperature with a thermometer!